In the early days of mankind, when our mental capacities were less developed, most of us worked in manual tasks which involved regular use of our bodies, through hard physical labour. Today, in this high-paced 21st century most of us are constantly applying our mental faculties, often concentrating on facts and figures, with little respite for our over-activated minds. Because of our decreased physical exercise, combined increased increased mental concentration we have less opportunity to relax our minds and bodies. This often results in our energy getting stuck in our shoulders and upper bodies causing anxiety, stress and discomfort. Our postures struggle to adapt to deal with the constant strain of sitting at computers and peering into the glaring screen for long hours each day. To avoid long-term illness such as back problems migraines and tightness in our bodies it is critical that we take time out to release tensions, increase mobility and unlock all these over-taxed tight muscles. By applying a few simple movements, with regular, even breathing and mindfulness, through the work of Qigong we can help to alleviate many of these aforementioned health problems. 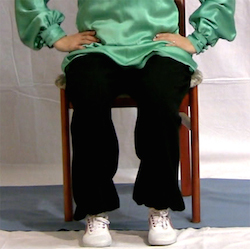 In this video, UK based Qigong Master, Fay Li Yip guides you through a simple, 2-minute, qigong routine designed to loosen, your neck and shoulders, and wake up your upper body. My spending these 2 minutes 2-3 times a day you will feel more refreshed, less stressed more fresh and alive with greatly increased vitality!